One of mother nature’s most industrious creatures, bees are seemingly unstoppable in their ability to work and produce. They are organized, efficient, and highly productive. The natural honey, propolis, and royal jelly they “manufacture” has numerous health benefits for humans. Honey bees produce propolis by mixing beeswax, sap from trees and flowers, and their own saliva. The propolis serves as glue to stabilize the hive, prevent vibration, seal up alternate entrances, and prohibit bacteria and fungi from growing, thus protecting the health and wellbeing of the hive and colony. Humans take propolis for a variety of health benefits, among them, to lower blood pressure, kill bacteria that can cause colds and infection, treat allergies, and strengthen bones and teeth. Royal jelly is a secretion made by nurse bees that is used to feed all the larvae in the bee colony. When it comes time to create a new queen bee, the worker bees select a few small larvae and feed them large amounts of jelly in cells that are made specifically for creating a queen. These high quantities enable a queen bee to develop with fully formed ovaries so she can take over in populating the colony by producing more bees. Queen bees are the healthiest and live longer than another bee in the colony, up to 20 times as long as other bees. Humans take it because it contains high concentrations of nutrients known to boost the immune system for antibiotic health, to aid digestion, alleviate menstrual pain, allergies, and the symptoms of asthma; regulate blood sugar, increase fertility, improve skin and hair health, and aid in weight loss, to name a few. If you’re wondering about the differences between royal jelly vs honey, RJ is the pure secretions with the concentrated elements, and honey contains everything the bees produce—pollen, propolis, and Royal Jelly combined. 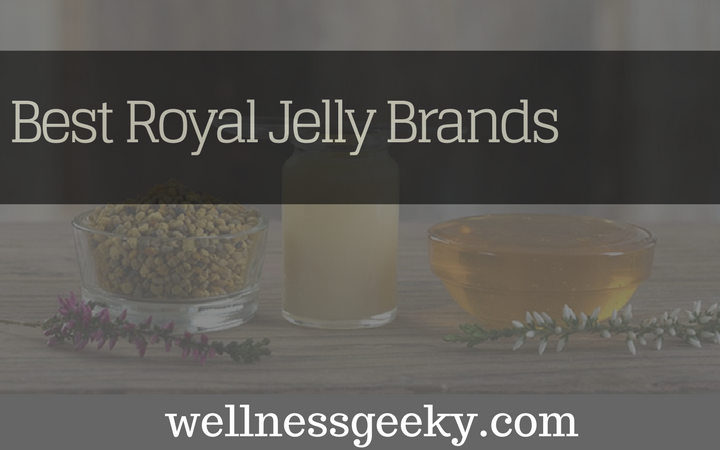 There are numerous health benefits of Royal Jelly and propolis been discovered. Not all brands and products are created equal Following are the top brands reviewed, how they compare. Ssupplements by Now are made by freeze-drying the Royal Jelly. This maintains the stability of the compound and keeps the nutrient-rich profile intact. This excellent whole food is great for boosting immune system health, fighting allergies, and increasing energy. 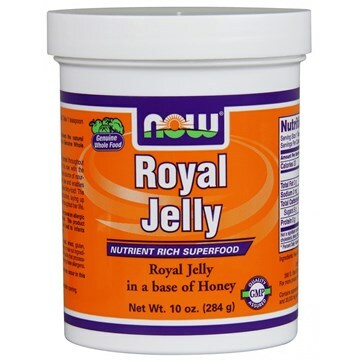 NOW brand is GMO-free, Good Manufacturing Practice certified, and the best royal jelly brand for fertility. 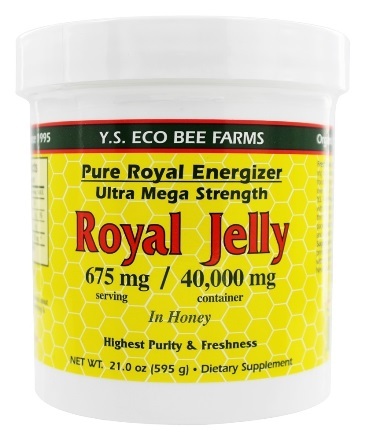 It comes in supplement form, each tablet containing 1,000 milligrams of Royal Jelly. While you can buy bottles in various amounts and sizes on Amazon, a bottle of 60 1,000 milligram tablets costs just about ten dollars, which is much more cost effective than raw Royal Jelly. YS Organic Bee Farms RJ is highly concentrated for maximum strength, coming in easy-to-swallow gel caplets that contain 2,000 milligrams. RJ in these dosages provides an enormous boost, keeping you alert and energized throughout the day. With no annoying aftertaste, it's easy to take in the morning with breakfast or a smoothie, and you'll feel refreshed and awake all day. It's great for increasing stamina and giving you a little extra energy if you want to hit the gym. Many people enjoy the effects of RJ if they're trying to give up caffeine, as it gives you similar effects without the jitters. It's also shown to increase fertility in some women, enabling them to get pregnant faster and without the use of drugs. Where to buy: Available on Amazon for just under 31 dollars for 75 capsules, it's slightly more expensive than other brands, but is freeze-dried for potency and stability, and each capsule contains double the dosage as most other brands. Known for its antibacterial and antifungal properties, propolis is used to line the walls of the bee hive in order to protect against germs that can cause infection and disease. Propolis is made up of wax, balsam, and resin, which contains flavonoids. Flavonoids provide therapeutic properties that improve the immune system. It's high in natural antibiotics and B vitamins, as well as rich in healthful minerals that enable the body to boost its own natural fighting mechanisms to ward off colds, flu, cold sores, canker sores, and increase vitality and energy. 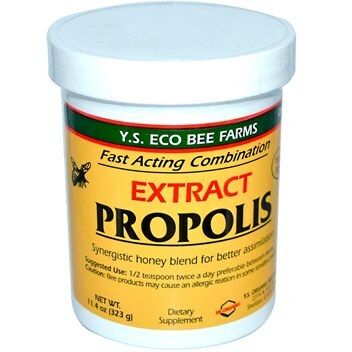 Similar in smell and taste to honey or molasses, YS bee Farms Propolis is great tasting and works well as a natural antibiotic. It has no side effects and it's great for applying directly to your skin. You can use it as a face cream to moisturize and revitalize, or anywhere you have a burn, bug bite, allergic reaction, or rash from poison ivy or oak. It's also great for oral health in the event you have a tooth infection or canker sore, and it can aid digestion and boost gut health as well. You only need a half a teaspoon once or twice a day, and it mixes easily into tea, coffee, or a smoothie. 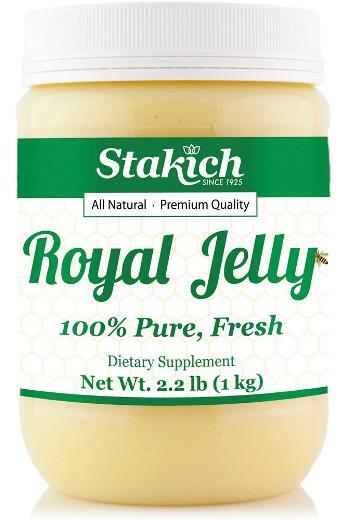 Stakich is the most reputable brand for fresh royal jelly. Theirs is 100% pure, fresh, and all natural. It's the highest quality jelly you can buy. It contains no preservatives, additives, or artificial flavors. The nature of the jelly makes it naturally gluten-, cholesterol-, fat-, and sodium-free. Stakich harvests the jelly, refrigerates it, and ships it in a cooler package, so it never loses its temperature stability. It will run you just under $130 on Amazon, and it’s worth every penny. It's rich in essential amino acids, nucleic acid, fatty acids, protein, enzymes, essential minerals and vitamins, and it's high in B vitamins. It's an excellent nutritional supplement that helps to increase energy, productivity, and mental acuity; improve skin and hair, neutralize hormonal imbalances, fight allergies. Stakich is a family owned and run company and has been providing healthful beehive products since 1925. They use only the finest all-natural ingredients. Whether you are feeling lethargic and in need of a healthy, natural supplement to increase your energy and vitality, have allergies, or suffer from cold sores or a low immune health, propolis and RJ are an excellent additive to your diet and exercise routine. Produced by the always-working, immeasurably efficient bee, there are few foods as good for us as those they manufacture. Bee pollen, honey, propolis, and royal jelly are always among the top choices recommended by health professionals for immune health, building bone strength, and enhancing brain function when it comes to all natural, healthy supplements.